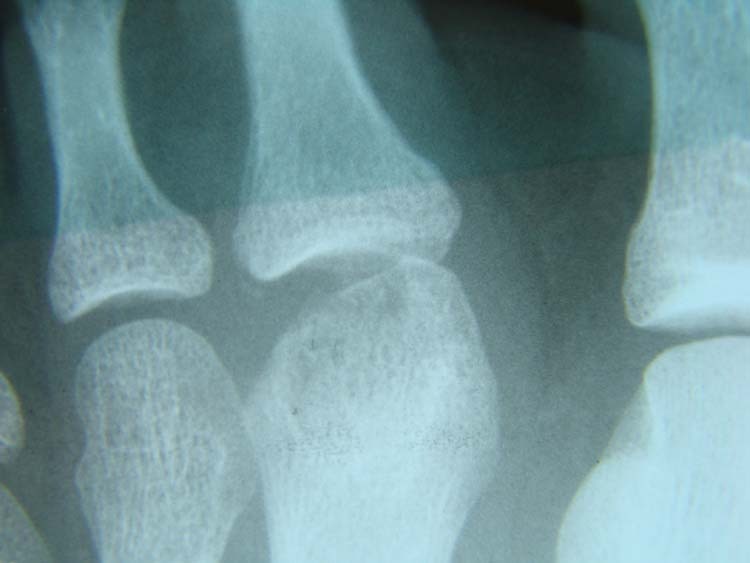 Freiberg’s infraction is a relatively common osteochondritis of the second metatarsal head. It appears to affect young women who are active in sports. Its etiology is thought to be traumatic in nature causing a painful alteration, subchondral disruption and collapse of the articular cartilage. A case report is presented describing this disorder in a young female runner. The use of a bioorthologic bone plug to surgically treat this condition is discussed and presented. It appears that the use of bioorthologic materials provide a promising alternative to surgical osteotomies. It has been shown that bioorthologic materials will provide a porous scaffold allowing blood, marrow and progenitor cells to wick into the pores and provide a stable environment for tissue in-growth and cellular development. Between six and twelve months, the polymer is resorbed and replaces the natural hyaline cartilage of the joint surface. Patients usually present with a painful and often swollen joint. A history of trauma may or may not exist. There is usually point tenderness to the dorsal aspect of the second metatarsophalangeal joint and associated limitation of joint motion. 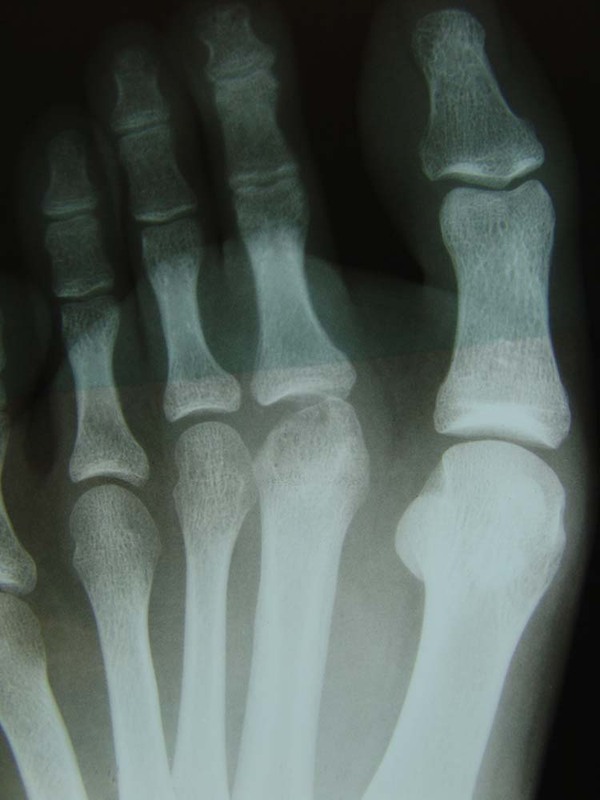 Diagnosis is often confirmed by simple radiographs which show varying stages of metatarsal head injury and articular depression. MR (magnetic resonance) imaging has been definitively shown to aid in the diagnosis of Freiberg’s infraction before joint changes occur on radiograph. This may be particularly useful in the early stage of the disorder when joint pain is present without observed changes to the joint surface. In his original article, Freiberg described his treatment which included simple removal of the loose bodies in the joint. Historically, there have been a number of surgical approaches to the treatment of Freiberg’s infraction. The use of bioorthologics is a relatively new approach to the treatment of osteochondral defects and injury. A case report is presented describing the use of the NEXA Osteocure™ bone graft for repair of a stage II Freiberg’s infraction of the second metatarsal head. An active fifteen year old female runner began having pain and discomfort to the second MTP joint. She did not recall any injury. She is very active in track and basketball. She has been running daily and relates to pain while running. She was using a silicone sleeve over the second toe and takes Tylenol and Motrin for pain and swelling. Her pain began to interfere with her running and she began seeking medical attention. 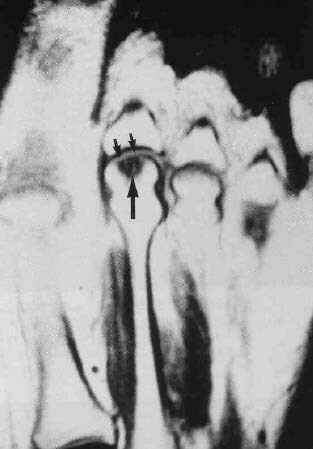 Figure 2 Initial radiograph shows subchondral disruption of the articular surface of cartilage involving the second metatarsal head. Note the long second metatarsal and Morton’s toe. She underwent MR imaging which revealed diffuse increased signal intensity with local tissue edema and hemorrhage. There was joint effusion with fragmentation of the metatarsal head consistent with Freiberg’s infraction, stage II. The patient had a track meet within three weeks of our visit and returned about four weeks later and underwent casting and immobilization. After cast immobilization, she was placed in accommodative metatarsal padding and shoes and was asked not to return to running for an additional month. However, she continued to re-develop pain and swelling to the joint and was scheduled for surgery to include osteochondral bone repair with bioorthologic graft using the NEXA Osteocure™ bone graft. 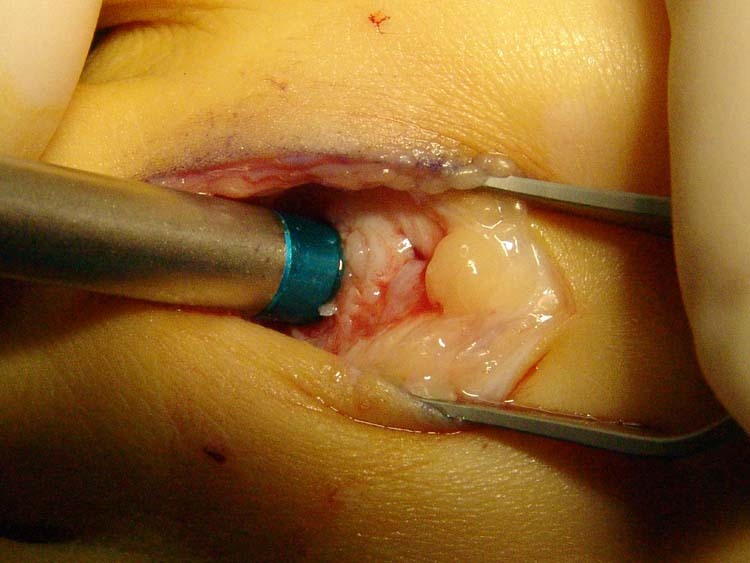 Figure 3 Once the joint is entered surgically, a dorsal linear capsulotomy reveals a loose joint body. The soft tissue capsule is delicately reflected to expose the cartilaginous surface of the metatarsal head. A large defect along the dorsal half of the metatarsal head is identified. The cartilage was actually separated from the underlying subchondral bone. Figures 4 and 5 The loose cartilage is identified and demarcated from the subchondral bone. Care is taken to identify the plantar cartilaginous attachment. 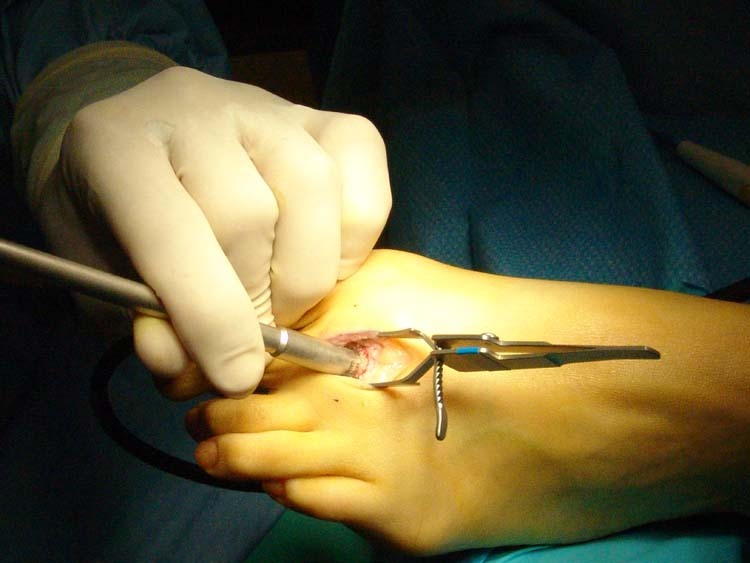 Figures 6 and 7 The loose cartilage is removed and the plantar cartilaginous attachment is identified. A semi-circular excision of the cartilage flap has been performed. A curette is then used to remove the soft, unhealthy subchondral bone. (Fig. 8) Preparation of the site is probably the most crucial aspect of this surgery. In particular, joint range of motion needs to be unimpeded dorsally and requires the removal of joint spurring, loose bodies and bone defects. Using the NEXA Osteocure™ Implant Kit, a corresponding set of color-coded sizers allows for determination of the bone graft size. Figure 8 A curette is used to remove any diseased subchondral bone. The diseased portion of bone is usually softer than the underlying cancellous bone. 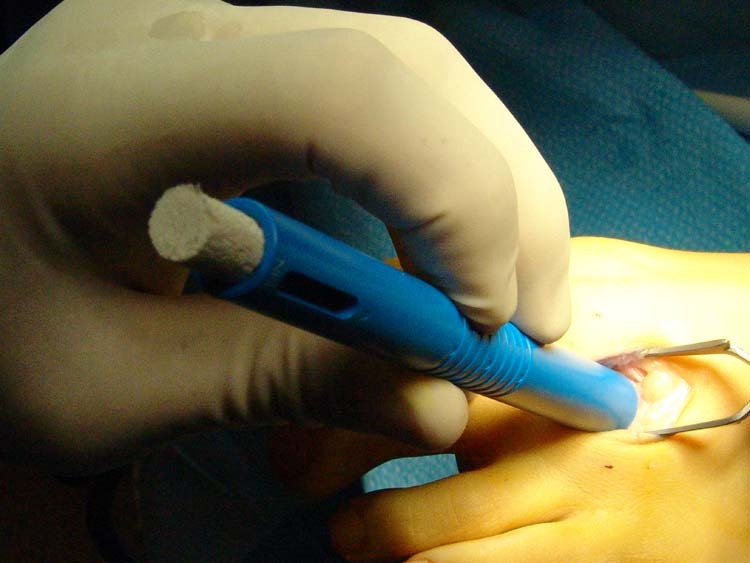 Figures 9 and 10 The bone plug sizer is used to determine the size diameter of the graft. Again, the inferior, semi-circular portion of healthy cartilage should fit directly to the sizer. Figures 11,12 and 13 The drill corresponding to the sizer is used to prepare the host site for the graft plug. Figures 14,15 and 16 The graft is measured for depth and then inserted into the host site. A small tap is used to secure the graft into the host site. Figures 17 and 18 The graft is seated in the defect. The Osteocure™ graft provides a press fit to the defect with close approximation to the surrounding bone and tissue causing migration of tissue into the scaffolding. This surface will provide scaffolding for hyaline-like cartilage in 6 to 12 months. The surgical site is then closed in the customary manner. The patient was then placed non-weight-bearing in a posterior splint and kept on crutches for 4 weeks. This was followed by 2 weeks of partial weight-bearing in a walking shoe. She was able to wear her athletic shoes within 8 weeks after surgery. The patient was pain free with an increase in joint range of motion. At last visit, she was playing volleyball without pain. (Figs. 19 and 20), however, the patient has been advised not run for six months after surgery to allow the graft to resorb. Figures 19 and 20 Two months following surgery, incorportation of the graft is already seen. A thin articular margin is also appreciated. Although, there is still some flattening of the metatarsal head, the patient is now asymptomatic. A close up of the radiograph (Fig. 20) reveals new subchondral bone formation in a cancellous pattern with metatarsal head resurfacing. In the majority of cases, the defect is usually dorsally located to the upper half of the articular surface of the metatarsal head. This would also lend support to the etiology of trauma causing this defect. In observing a number of these cases, mechanical changes appear to cause a dorsal articular jamming and trauma to the joint surface. These include a Morton’s toe or long second digit, a short first metatarsal or elongated second ray and instability of the first ray. Limitation of dorsiflexory motion of the second MTP joint will lead to progressive joint damage and eventual articular shear. This will cause an actual lifting and separation of the articular cartilage from the subchondral bone disrupting the vascular supply to the articular cartilage. Once the articular cartilage separates, the cartilage can fragment. The fragments that separate from the articular cartilage are called joint bodies or joint ‘mice’. As previously stated, ‘infraction’ is sometimes called Freiberg’s ‘infarction’. Infarction would suggest a vascular event leading to osteonecrosis. It has been suggested that avascular necrosis from injury will lead to the growth plate or epiphyseal injury in young, growing bone. This may also explain why the incidence is higher in young women and girls. In 1959, Braddock observed that there is a relative weakness of the second metatarsal epiphysis at a certain stage of epiphyseal maturation. Whatever the etiology, the result appears to cause cartilage lifting and separation from the underlying subchondral bone and vascular osteonecrosis of the joint surface. The extent of articular damage however, appears to be directly proportional to the extent of joint pain. Treatment, including both conservative and surgical approaches, varies to the extent of injury. In early stages, where the articular cartilage may form a small depression, treatment usually consists of immobilizing the joint. Conservative treatments should almost always consist of immobilization, offloading and casting irrespective of severity and stage. The goal of non-operative immobilization is to promote a decrease in joint effusion and inflammation including the surrounding soft tissue structures. This may be supplemented with NSAID therapy, joint injections and oral steroids. In patient’s who may not want surgery, shoe modification, metatarsal bars, orthotics and even rocker bottom shoes may provide some temporary relief. In a majority of cases, operative intervention is recommended to provide improved joint mechanics, remove damaged joint spurs and loose joint bodies and treat the osteochondral defect. Freiberg initially described removal of the loose bodies to the affected joint. Other treatments have been more aggressive, including the actual removal of the metatarsal head. Unfortunately, this will lead to more complicated conditions of the foot including transfer metatarsalgia, stress fracture and contracture of the corresponding digit. Some authors have also suggested joint arthroplasty and resecting the base of the proximal phalanx. This may decompress the joint, but joint instability and toe shortening or dorsiflexory rotation of the digit is a major complication. Critical size chondral defects were created on the stifle joint of adult goats. Experimental defects underwent marrow stimulation to recruit reparative stem cells and were primed with a chondroitin-sulfate based adhesive to anchor the scaffold. Controls received marrow stimulation alone. The operative goat legs were cast for two weeks and after 13 weeks, cartilage fill and repair quality was assessed by histomorphometry evaluation. Results revealed evidence of hyaline-like repair with a 12% increase in total tissue fill in scaffold-treated defects on histomorphometry. 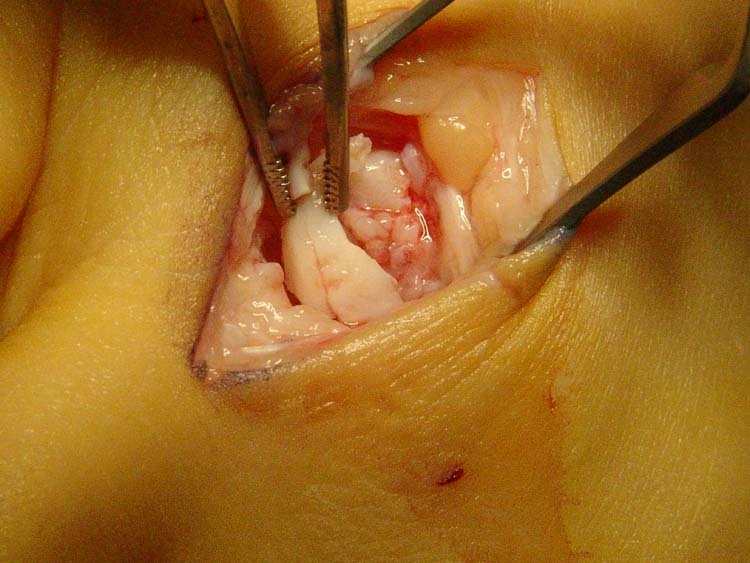 Remodeling and articular cartilage bridging was seen up to twelve months after implantation. Although there is no one consensus on the best surgical treatment for this condition, the use of orthobiologics provides a promising new attempt to restoring the cartilaginous surface of the joint and eliminating joint destruction and pain. More importantly, these products appear to heal and replace the natural hyaline cartilage of the joint surface. 1. Freiberg, AH. 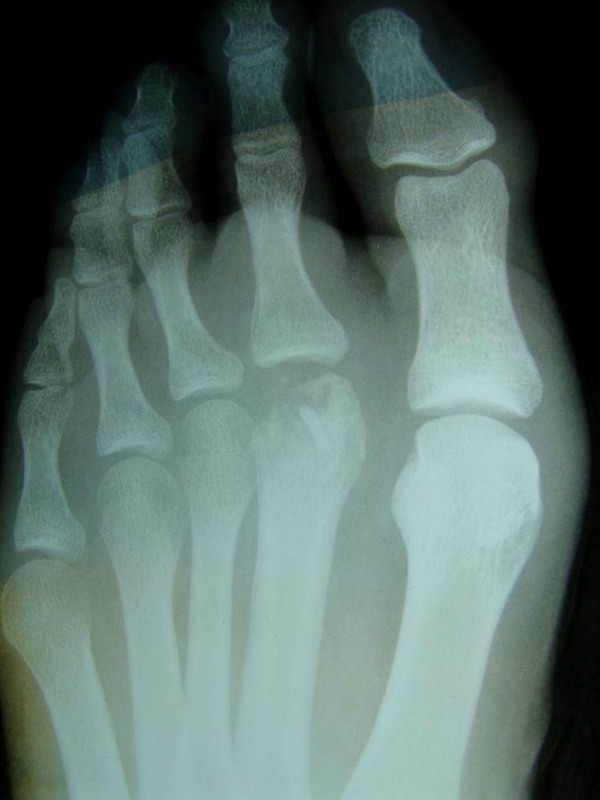 Infraction of the second metatarsal head, a typical injury. Surg Gyn Ob, (19) 163-191, 1914. 2. Boyer, M., DeOrio, J. Freiberg Infraction. E-Medicine, Online article, 2004. 3. Braddock GTF. Experimental epiphyseal injury and Freiberg’s disease. JBJS, 41B (1) February, 1959. 4. Stoller DW. Magnetic Resonance Imaging in Orthopaedics and Sports Medicine. J.B. Lippincott Company, Philadelphia, 1st edition, 1993. 5. Smith TW, Stanley D, Rowley DI. Treatment of Freiberg’s disease: A New Operative Technique. JBJS 73B (1), January, 1991. 6. Shih AT, Quint RE, Armstrong DG, Nixon BP. Treatment of Freiberg’s infraction with the Titanium hemi-implant. JAPMA 94 (6), 590-593, Nov/Dec 2004. 7. Blitz NM, Yu JH. Freiberg’s infraction in identical twins: A case report. JFAS, 44(3), May/June 2005. 8. Cascio B, Sharma, MS, Fermanian, BS, Elisseeff, J: Chondral lesion repair in a critical size defect model using injectable hydrogel scaffold in conjunction with marrow stimulation. AOSSM, Poster #32, 2006. 1 Adjunct Clinical Faculty, Barry University School of Podiatric Medicine. Private practice, Chief of Podiat ry, Doctors Regional Medical Center. Corpus Christi, Texas, 78411. This entry was posted in Uncategorized and tagged bioorthologic bone graft, Bone graft plugs, Freiberg's infraction, Osteochondritis dessicans, Osteochondrosis, Uncategorized. Bookmark the permalink.